Institute arranged a special seminar on “Contribution of Microfinance to GDP in Bangladesh” on September 14, 2015 at 02:30 P.M. in Media Bazar, Bangabandhu International Conference Center (BICC), Dhaka, Bangladesh. 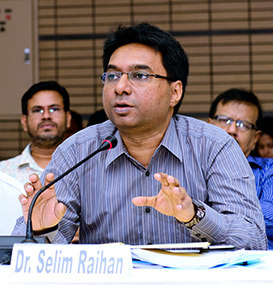 Dr. Selim Raihan, Professor, Department of Economics, University of Dhaka, and Executive Director, South Asian Network on Economic Modeling (SANEM), presented the keynote paper. 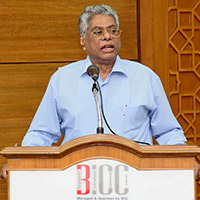 Dr. Sultan Hafeez Rahman, Executive Director, BIGD, BRAC University; Dr. Quazi Mesbahuddin Ahmed, Chairman, Institute of Microfinance; and Dr. Mustafa Kamal Mujeri, Former Director General, BIDS, presented as the Distinguished Panelists. Dr. Shamsul Alam, Member, General Economic Division, Planning Commission, Ministry of Planning, GoB, and Dr. M. Aslam Alam, Secretary (Banking), Ministry of Finance, GoB, were present as the Guests of Honor. Mr. M. A. Mannan, MP, Honorable State Minister, Ministry of Finance and Ministry of Planning, Government of the People’s Republic of Bangladesh, was present as the Chief Guest at the Seminar. Dr. Qazi Kholiquzzaman Ahmad, Chairman, InM, presided over the session. 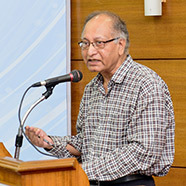 Professor Raihan said at this point microfinance has spreaded throughout the length and breadth of rural Bangladesh, covering more than half of the rural population. As per a recent study, somewhere in the range of 55 percent of rural households have taken microfinance at some stage in their lives, and almost 46 percent of households hold the status of current borrowers (as of 2010). With such huge expansion, microfinance is bound to have direct and indirect repercussion on the overall economy. Microfinance is believed to be contributing to the integration of the rural financial sector and stimulating the economy through micro credit and saving programmes. The study found that the contribution of microfinance to GDP in Bangladesh in 2012 was between 8.9 percent and 11.9 percent depending on the assumption of the labour market. Furthermore, the contribution of rural microfinance to rural GDP in Bangladesh in 2012 was between 12.6 percent and 16.6 percent depending on the assumption of the labour market. However, such estimation is subject to underestimation due to two major reasons: (i) the model didn’t consider underemployment, and the labour market adjustments compensate some of the negative effects generating from withdrawing of MFI-capital; and (ii) the share of the rural GDP might be lower than 60 percents very high urban income are not usually captured by household survey; and this would imply that the contribution of rural microfinance to rural GDP in Bangladesh would be higher than what we have reported here. He congratulated all for a wonderful scientic paper. He mentioned that numbers of study has been done to see the micro level success of the microfinance programme. But this macro research will be the pioneer one in the history of Bangladesh microfinance sector. He also said from the model it is difficult to find out the exact result since model can not calculate the real life complications. If one can calculate that the contribution would be higer than 6 to 8 percent. This type of research should go on. He also mentioned that indirect contribution through financial sector development should incorporate here. If these points are missed huge impact might be missed here. He said it is important to mention few points regarding microfinance. Microfinance has huge impact on households income, livelihoods, GDP, poverty, health and so on. Microcredit in Bangladesh is compare to other countries are completely different one. He mentioned that in India Self Help Group model is dominant. Here in Bangladesh it is group based. In the history of microcfinance only Bangladesh has Microcredit Regulatory Authority. In 2011 a bill was raised in parliament of India which is not implemented till date. Only Bangladesh has regulators. We does not operate micro credit as commercial basis. Early 1980s, scholars used to say microcredit has no impact and value addition in GDP. But the notion is changing. Now PKSF disburse more than 35% of its total disbursement in the real sector. Whichever value addition is happening intermediary stage every stage is part of GDP. Microcredit productivity is extremely high and in his opinion we all should accept it. This is a pioneer work and here a complex reality is presented in an effective manner. He suggested these types of work should go on. He raised as question ‘is this growth enough’? He also mentioned that in which way it can be increased that option should be incorporated here. He mentioned that earlier microcredit, in case of emergency people used to take loan from informal money lenders at very high interest rate or used to sell land, gold or livestocks. Needless to say that these hundreds years traditional practices has been changed because of microfinance. He also mentioned that microfinance definitely has a postive impact on GDP and in his opinion the percentage should be more. He suggested that this types of research must go on. He said, Through this research our assumption got an extra estimation. And it is also found that MF sector is investing more in Agriculture sector and it is creating huge impact in GDP. For policy implementations more desegregated versions are required like impart on human development, education, poverty inequality, price of capital, rate of interest, and impact on rural employment. if these can be found, to prepare priority based policy would be easier. As per Bangladesh Bank rules, all commercial banks have to invest on SME financing and Agriculture. Bank provides trhese loan through the MFIs, So if there are any duplicacy, that should be identified. Lastly he mentioned these information will be useful for all and more researches are needed to be done in this regard. He said, we agree that microfinance does contribute in GDP which is obvious. As the funding is increasing day by day ofcourse there should be a positive consequesces. This study proof that as well. He mentioned that, now it is our responsibility to help the prosperity of the microfinance programme. He believes any productivity should matters and be counted. Lastly in his concluding remarks he mentioned this study will be really helpful for the Government. He thanked InM for arranging such a wonderful session. He mentioned that this is the high time we should detag the word micro from microfinance and incorporate appropriate finance. He said that in his opinion the 1st generation microcredit is over and these 2nd generation microcredit can not or should not be operated with the same formula. Microfinance is not only limited within the credit system. It is taking care of the education, training, health and sanitation, insurance and other relevant matters as well. For livestocks it has shown a good success, more focus is required in the field of crops and health. There is no doubt microfinance is contributing to national GDP but more can be done in this regard and this is the high time to start working effectively along with the Governement. Need to spread hand towards those who really needs the credit along with proper incentives so that more contributed could be depicted in National GDP.